On Saturday September 21st from 11am to 2pm. 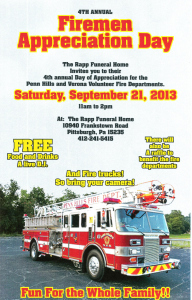 Our Friends over at Rapp Funeral Home are holding a Firemen Appreciation Day for Penn Hills and Verona Volunteer Fire Departments. There’ll be food, drinks and music for the whole family. They also will hold a raffle to benefit the fire departments. Click on the link below to see the flier! Hope to see you there!